I would like to monitor, record, specific variables in an application but I am not sure what is the right way to approach this problem. The application is a mix of C(5%) and C++(95%) and it is relatively big, around 5 million lines of code. The target OS is CentOS 7 and my application is always compiled with debugging flags (-g3 -ggdb) and I can add/remove flags if necessary to achieve what I am looking for. In the ideal scenario I don't want to instrument the code in the main application, mainly due to the size of the app, and/or add any overhead to my application. I am still not sure about how I can handle different data types, maybe I can somehow infer the data type by parsing the main program but I am now sure. I understand that the OS won't let me easily access the memory of another process, but there should be a trick. What is that trick? Is there a more straight forward way of doing this? What is the overhead associated with this? Is there a way to also write into a variable? The second approach is more interesting because everything is in its address space, so no trick is requuired. How ever I still have to know the type of the variable. I am sure others have had similar problems but I don't know what this process is called. What should I search for to get more information? I understand this is a very general question, any pointers are highly appreciated. well if you can use a debugger then you can employ a variety of monitoring techniques. 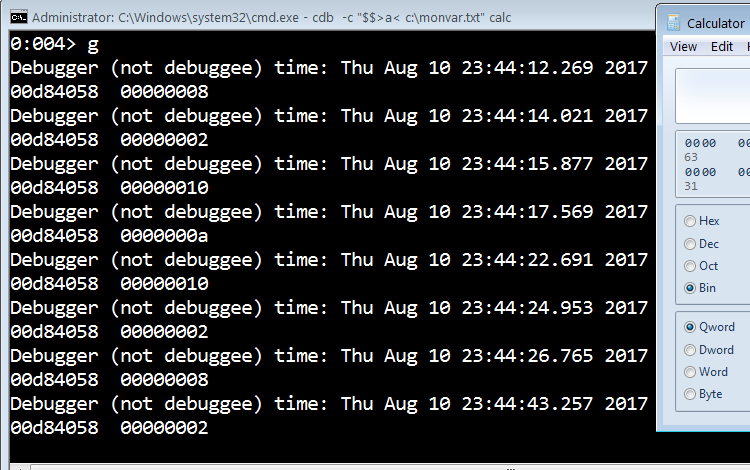 The example below is for a windows app being debugged by windbg. ba w 4 calc!g_nRadix ".echotime;dd calc!g_nRadix l1;gc"
What you are looking for is called value profiling. It's a technique that aims at logging the values of certain variables (like loop bounds) in order to extract all possible values and use them to fine tune the code for better performance. One thing you should know, once you compile your code, debug info or not, there's no more notion of variable. And, if you use a compiler optimization flag, and you should, variables will be optimized out. This said, your best option is either to go through your code and put prints manually (even through a parsing script); or you can go with a compiler plug-in. If you are using GCC, I would recommend writing a plug-in guided by your own directive i.e. #pragma watch var which then instructs the compiler to instrument at the GIMPLE level with a function from a library - let's call it watch_var.so. This library's functions look like the following prototype : dump_int_var_value(FILE *fd, char *var_name, int var_value). 1) Placed before variable declaration, var1 & var2 will be watched. 2) Placed at the beginning of a block, x and y will be watched in the first example. And, only i will be watched in the second one. From here, I guess you get the idea. From where I stand, I see this as the only clean solution to handling variables without having to re-invent the wheel or delve into complicated tricks. Not the answer you're looking for? Browse other questions tagged binary-analysis c++ memory or ask your own question. How to predict address space layout differences between real and gdb-controlled executions? PE file format: How can I find the heap memory space in a running WinNT program?